We all know the purpose of a cat door – they useful for letting your cat into and out of places without your help, so you don’t end up being a Feline Doorman for the rest of your life! But not all cat doors are meant for letting cats freely come and go outdoors – some are purrfect to use or even created for interior door use instead! I’ve loved the idea of having indoor cat doors integrated onto the bottom of my interior doors since I learned this type of product existed. It’s so ridiculously cute, and can be ever so practical as well. Yes, I said “practical” when referring to a lil’ ol’ interior cat door, and I meant it. They come in handy for so many different purposes, it’s insane. 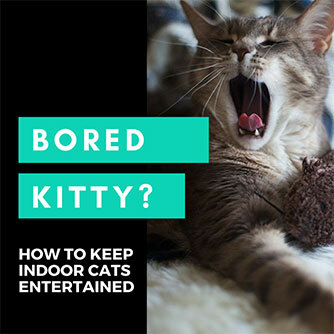 You’ve also got a dog and he/she really likes getting into your cat’s litter box. 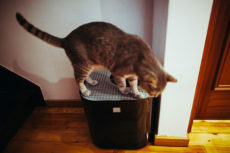 You could get a top entry litter box, or instead, you could place the litter box you already have in a specific room that the dog’s never allowed into, add one of these to let your cat come and go freely – boom! Problem fixed. 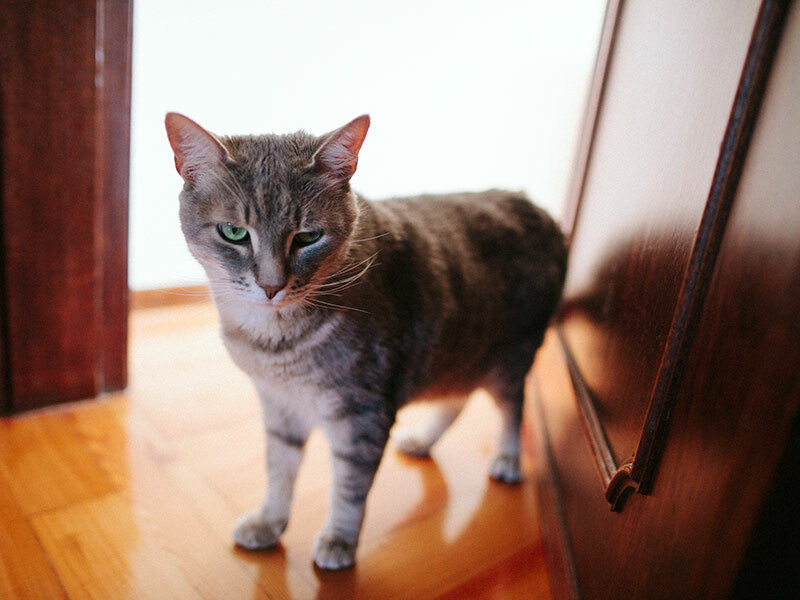 You want your cat to have free access to the basement, but have toddlers and want to leave the basement door closed so they don’t somehow make their way down. You have your cat’s food and litter box in the kitchen, but sometimes your hubby forgets while he’s cooking and closes the door. 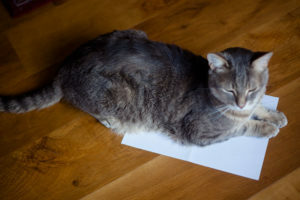 You’ve got more than one cat, and they sometimes fight, eat different types of kibble, or have different dietary needs from one another (example: one has a sensitive stomach issue where he or she has to graze all day to prevent an upset tummy, and the other struggles with weight issues if open-fed). Need one cat to be able to get into a dedicated room or into a dedicated small space that another cat’s not allowed into to eat? No problem, just grab a microchip cat flap like the SureFlap to use inside. 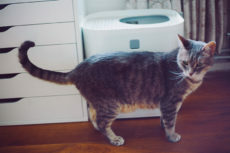 One pet owner paired the SureFlap with the Merry Pet Cat Washroom for her kitten – genius solution! 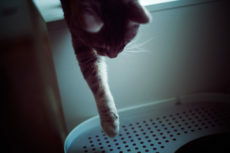 You place your cat’s litter box in a closet as a make-shift hidden cat litter box, but don’t want to leave the door ajar or wide open all the time. 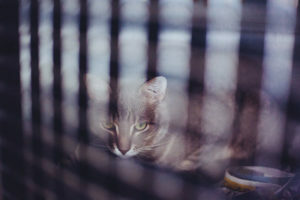 You frequently use a room heater, have a fireplace going, or have a single-room air conditioner unit, but want your cat to be able to freely go in and out while the door is shut to maintain the perfect temperature. Yeah, I told you, practical uses, and I’m sure there are plenty more I haven’t thought of. As you’ll see for yourself, these things are crazy adorable for the most part. Hence, in my case, while I don’t actually have a practical use for them, I find myself trying to invent uses so I can integrate ’em on at least a few doors! Let me know if you’ve bought, DIY-ed or thought of having an interior door with cat door someplace inside your house, and what room and purpose you wanted it for (or if you just thought they were too cute to resist having, like me!). Enough about how awesome I think these things are – let’s get into what I think are some of the best options currently out there. If I had to choose one cat door I thought reigned above all the others in terms of cuteness, it’d be this crazy lil’ thing. All cat ears in the front, a wavy cat tail in the back – I dare you to tell me it’s not adorable! There’s pictures of pet parents using this thing to keep kids out of spaces they want their cats let into, to give cats access to the crawl space beneath stairs (what cat wouldn’t love this? ), as well as to give access to the basement, where the litter box is kept, in a way that never means the door has to be left ajar. Crazy cute, crazy convenient, what more could a pet owner want? 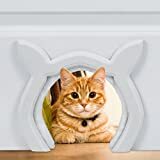 If you’re looking for a rounded interior cat door rather than one that comes in the shape of a cat head, this is probably the best option currently out there. 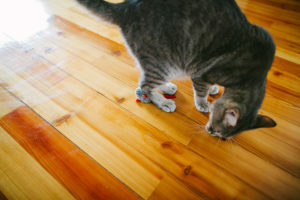 It comes with a removable grooming brush, in case your cats love the sensation of brushes, and it looks quite pretty integrated into the bottom a door. This particular interior cat door is painted by pet owners quite frequently, and not just in plain white sometimes. 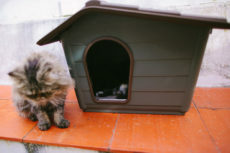 Alternatives you may want to look at before committing to the CatHole include: the Interior Cat Door (Pink or White) with Clip-on Removable Grooming Brush & the Purrfect Portal Cat Door for Interior Doors with Grooming Brush. 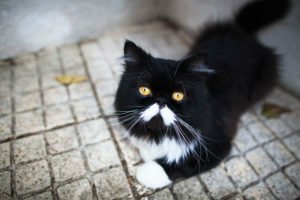 Microchip cat flaps come in especially handy when you have multiple cats at home, and one or more of those cats could really benefit from having a space to him or herself – to use the litter box, to eat, or even to hide away from other cats in the household who can sometimes be stressful or aggressive. 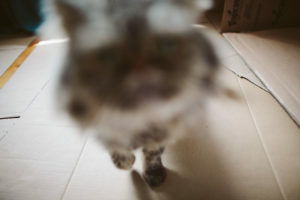 Integrating a microchip flap is a great long-term solution, whether for maintaining peace, for healthcare reasons, or for overall well being of one or more of your cats. You can integrate a microchip flap onto the door of a room so only a select number of your cats have access to that space. You could also integrate one into a piece of furniture, like a hidden cat litter box, a cat house, or a dresser. You could integrate one into a closet door as well, or into a wall. There’s no short of options you have with these things. As I mentioned in the intro one pet parent took the time to pair their SureFlap with the Merry Pet Cat Washroom for her kitten to create a feeder box that only the new addition could eat in. Perfect long-term solution to a common problem multi-cat owners have. 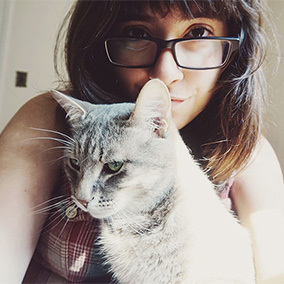 Think of any other reasons you may want to give a cat or two a space of his or their own? Let me know in the comments! Looking for an alternative to the SureFlap? 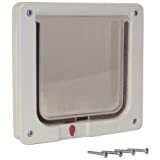 PetSafe makes a microchip cat door as well. The Purrfect Portal is another excellent option if you’re looking for a proper indoor cat door to integrate in your home. Apparently the installation of this particular product is a breeze, but if you’d like some installation tips, a helpful pet parent left some here. 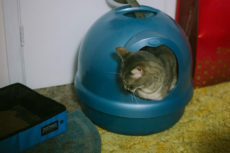 Lots and lots of cat owners seem to be using this one in particular for hiding litter boxes in closets, though one said she used hers so she could shut the laundry room door but still allow her cats access, and another seems to have used it to allow cats access to an office or living room. Want a cat door so your dog can’t get into a space, but really hate the idea of drilling into your door? Prefer to have something you can remove if you want to, or rent and really don’t want to forfeit your security deposit? Based on quite a large number of pet parent reviews, it works just as advertised. 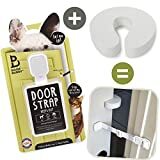 Another product that works perfectly if you just wanted an interior cat door to keep a large dog or even a baby away. There are a number of tall pet gates like these, that have integrated small cat doors at the bottom so your cats can always get through to where they need to be. These things are super handy, but I’m sure many who have medium to large dogs who get up to no good in the cat litter box don’t even know they exist, which is why I thought I’d list them here. Way more than just an indoor use cat door, but still has one integrated! Another option, and really well priced. Not as durable as the other options based on what I’ve read, but it seems to me if you’re looking for an affordable so you can integrate these in many spouts around the house, they should be purrfect. If you really need to be able to install the type of cat door that’s easy to keep open one minute, and lock shut the next, you may want to try grabbing one of these exterior door intended lockable cat flaps. Need a larger version of the same? Try having a peek at Cat Mate’s Large Cat Door in White. Want a pet door so you can keep a specific room warm or cool with a space heater or a one-room air conditioning unit? You’re probably going to want some type of flap on the cat door you buy. 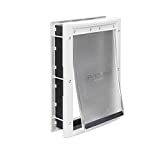 Luckily, PetSafe makes some really affordable outdoor-door cat flaps that I’d think could also be used on many interior doors as well. They come in a bunch of different sizes, from small to extra large in case you also want to grant access to large dogs as well. Your Thoughts on Indoor Cat Doors? 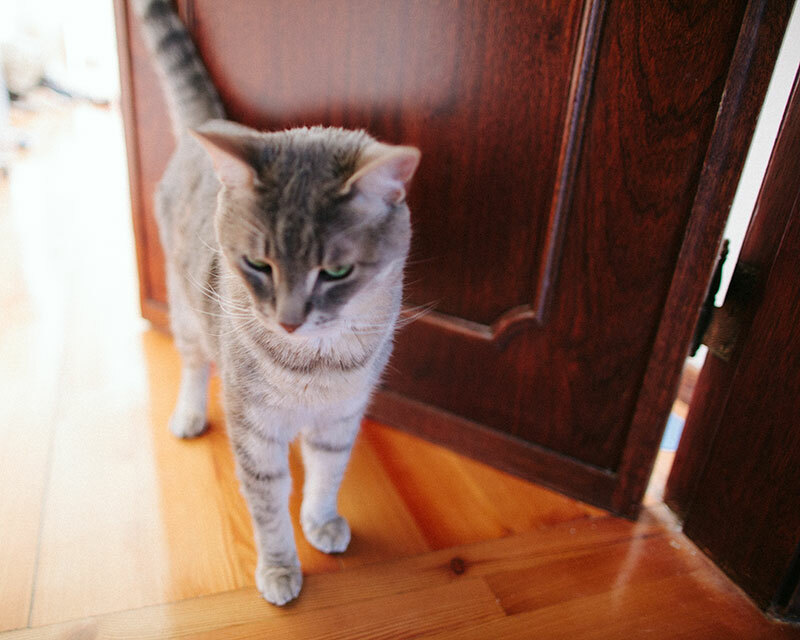 What types of uses do you think an indoor cat door is most suited for? Can you think of any practical uses I haven’t listed here? 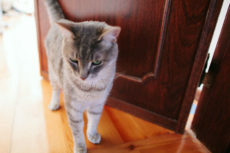 Have you ever thought of integrating an interior cat door before? Have I made you think of a use or two in your household you didn’t consider before? Would you ever try a microchip cat door to feed cats separately? If you have dogs you need to keep away from the litter box, could you imagine one of these being handy? Which type do you think would work best for you? Can’t wait to hear your thoughts about these in the comments below! The Hubby has created his own interior cat flaps, using some sort of thick plastic, some thin wood and nails! He removed a lower pane of glass from the french door, then made a flap so the cats can pass through. When Da Boyz are chasing each other, they hit the one flap HARD, but it’s working! Whatttt that is so clever – removing a pane of glass and replacing it with a cat flap!